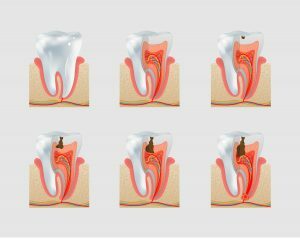 What is a Cavity & How Did I Get It? Cavities. Just hearing the word can send shivers down spines. For some, hearing they have a cavity is like having their prized badge of Good Oral Hygiene revoked forever, leaving them disappointed, sad, and in pain. Plus, the thought of getting them filled during a separate dentist appointment doesn’t help. For all the fear surrounding cavities, a fair number of people don’t actually know what they are. It’s okay if you can’t define what a cavity is; that’s why we’re here! Let’s dispel some of your fears and worries with facts. Simply put, a cavity is a little hole in your tooth. According to the American Dental Association, a cavity is the destruction of your tooth enamel, which is the hard, outer layer of your teeth. You may be wondering why your tooth can’t repair itself like other parts of your body. This is because tooth enamel does not contain any living cells, so once it’s damaged, only a dentist can fix it. So what causes this little hole form? One word: plaque. This sticky film containing bacteria builds up on your teeth over time. If not properly removed, the acids produced by the bacteria will break down the tooth’s enamel – causing a cavity. While cavities are more common among children, a cavity can develop at any age. Some get cavities at age five–even after brushing–some make it until their 30s before they get one. How do you determine if you have a cavity? If you have a cavity, chances are that you will not be able to feel it, at least not right away. It forms in the enamel of the tooth, which does not contain any nerves. However, if the cavity has decayed to the softer tissue inside the tooth (where the nerves are), you may experience teeth sensitivity and pain, especially after eating foods that are hot, cold, or sweet. If you are experiencing tooth sensitivity right now, don’t panic – tooth sensitivity is not always caused by a cavity. The best way to determine if you have a cavity is to visit your dentist. A dentist is usually able to diagnose a cavity with a simple checkup, so it is important to maintain your semiannual dental hygiene exams. Additional testing, such as x-rays, are usually needed because most cavities are not visible to the eye. The most effective way to help prevent cavities is to maintain proper dental hygiene. This means brushing twice a day and flossing in-between your teeth daily. You should also take precautions when it comes to sticky, sugary foods by brushing your teeth after you eat them or avoiding them all together. Lastly, visit your dentist twice a year for your dental hygiene exam. A professional dental cleaning will remove plaque and tartar (hardened plaque) that is not removed by regular brushing and flossing. If it has been at least six months since your last teeth cleaning, we encourage you to make an appointment. Give us a call at 540.989.6600 and we would be happy to schedule a checkup that fits your schedule.